DutchCrafters Tall Windsor Dining Room Chair is made in a small woodshop in Holmes County, Ohio by an Old Order Amish woodworker. We are proud of the fact that we carry only American made furniture. We also offer this Windsor Chair design in a short back version and both would pair nicely with a solid wood dining table. 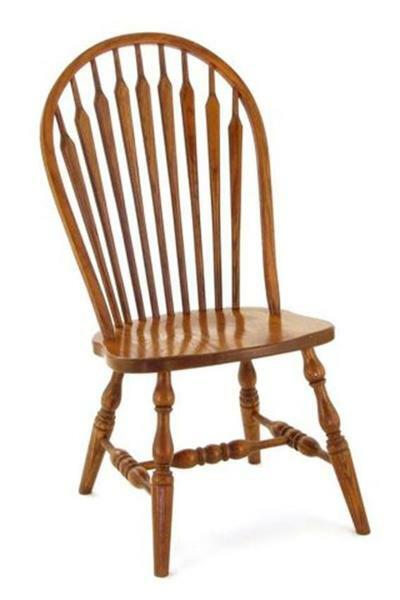 If you are looking to spruce up your kitchen furniture or dining room furniture then consider our Amish Windsor chairs. Many look for antique Windsor chairs but why not consider an Amish Windsor chair that looks like an antique but is brand new. We can even finish the Windsor chairs in an antique looking finish. Please call to speak to a furniture specialist at 1-866-272-6773 for assistance with our Amish furniture.